Situated in Granges-Paccot, this hotel is within 2 mi (3 km) of Forum Fribourg, Art and History Museum, and Espace Jean Tinguely – Niki de Saint Phalle. Gutenberg Museum and St. Nicolas Cathedral are also within 2 mi (3 km). Located near the slopes, this Fribourg hotel is in the city center and within a 15-minute walk of Espace Jean Tinguely – Niki de Saint Phalle, Fribourg Centre, and Jo Siffert Fountain. Gutenberg Museum and St. Nicolas Cathedral are also within 5 minutes. Fribourg Station is 15 minutes by foot. 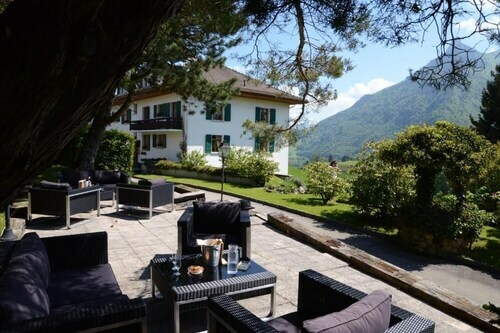 Situated in Saanen, this hotel is within 3 mi (5 km) of Gastlosen, Relleri Ski Resort, and Schonried Horneggli Ski Resort. Gstaad Ski Resort and Eggli Ski Resort are also within 3 mi (5 km). Saanen Station is 21 minutes by foot. 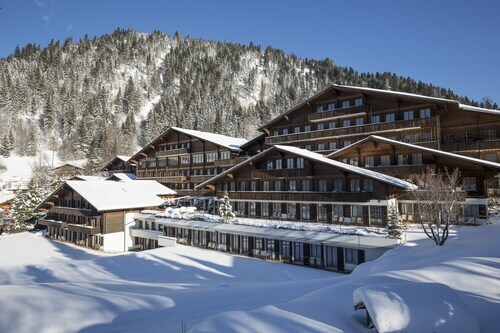 This family-friendly Saanen hotel is within 2 mi (3 km) of Relleri Ski Resort and Schonried Horneggli Ski Resort. Gstaad Ski Resort and Eggli Ski Resort are also within 3 mi (5 km). Saanen Station is 15 minutes by foot. How Much is a Hotel Room in Rossens? Hotels in Rossens start at $59 per night. Prices and availability subject to change. Additional terms may apply. Researching a place in Fribourg, specifically in the Rossens area? The Travelocity hotel guide presently has listed 6 hotels in and around Rossens. Travelocity-listed accommodation options that are located within driving distance of Rossens include the Au Parc Hôtel and Hotel De La Rose. 19 miles (31 kilometers) away from downtown Rossens, you can find the The Alpina Gstaad. The Grand Hotel Park is approximately 20 miles (31 kilometers) away. Other possible Travelocity-registered hotels are the Hôtel des Trois Couronnes and the Le Grand Bellevue. When you have got to know Rossens, venture out to soak up the many other delights of the Western Switzerland area. Discover Western Switzerland's castles, traditional villages and old towns or admire the region's lakes and mountains. Wise visitors in this pocket of Switzerland often enjoy snowboarding, skiing and cross-country skiing. Gruyeres is situated 14 miles (23 kilometers) to the north of Rossens. During your visit, you can spend some time at the 1476 Battle Monument. Murten has some nice Travelocity-registered hotels to spend a night or two. Don't overlook Gruyeres, where you can spend a little time at the Castle of Gruyeres. Gruyeres is situated 11 miles (17 kilometers) south of Rossens. Travelocity-listed rooms in Gruyeres include the Hostellerie Le Castel and Hostellerie Saint Georges. If experiencing the thrill of stadium sport if on your list of things to do, stop by Stade de Suisse Wankdorf, which you can find 25 miles (39 kilometers) to the northeast of Rossens. 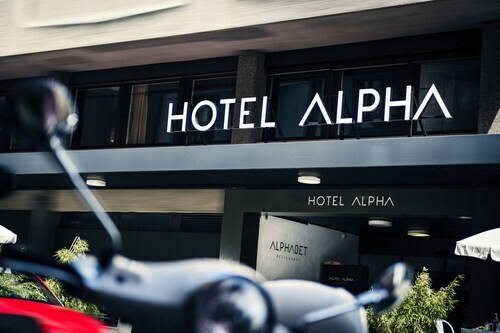 Book Travelocity-listed accommodation right in the thick of the sporting action at the Hotel Bellevue Palace or the Hotel Schweizerhof Bern. Belp Airport is a closeby arrival point for flights, and is found 25 miles (37 kilometers) outside the heart of Rossens. Travelocity-listed hotels located close to Belp Airport are Apartments Justingerweg and Hotel Sternen Muri. Very nice hotel. Very clean. Friendly staff. Nice bed. Very comfortable. Lovely hotel with a nice mountain view. Nice rooms, minimalist bathroom, lots of cable content, including 20 English channels (most have had 2-3). Good included continental breakfast with eggs. Great dinner options but that's a different review. Free parking 500m away or underground parking for 10chf. 5.0 Famili?r und trotzdem zeitgem?ss! Vom Empfang ?ber die Betreuung w?hrend des Seminars, dem Speiseservice bis hin zum Check-Out, top kompetente und sympathische Begleitung durch zuvorkommende Mitarbeiter! Qualit?t der Seminarinfrastruktur und Zimmer ausgezeichnet, abwechslungsreiche K?che! Ich w?rde dieses Haus auch an Privatreisende weiterempfehlen, da der historische Stadtkern von Fribourg einiges an Sehensw?rdigkeiten zu bieten hat!\nHerzlichen Dank!